What is Natural Building, Anyway? Are “natural buildings” all made of mud, with fanciful designs sculpted into them? Aren’t most houses made of wood, isn’t that natural? Can a “natural” building also be comfortable and full of modern conveniences like heating and cooling systems and electric lights? Is natural building easier to learn than conventional building? Is there such a thing as natural paint? There are plenty of questions that arise when you begin to explore the idea of “natural” building. 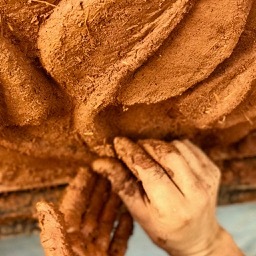 It is a vast subject indeed, including many different materials, techniques, and tools. That’s part of why taking a natural building course is a great way to familiarize yourself. Natural building is an overall approach, not simply a handful of techniques. It is an ecology of construction, and a mindset that underlies both design and implementation. Sustainability: Materials that are renewable and/or recycled or repurposed; smart designs that reduce waste and increase efficiency; human power instead of machine power where appropriate, smaller overall ecological footprints. Non-toxic materials: Steering clear of chemicals that cause harm to human and environmental health. Locally-appropriate designs and materials: Passive solar design; locally sourced materials; working with natural topography; considering local weather patterns in building designs. Practicality: Working smarter, not harder; embracing simplicity; repurposing and recycling materials; efficient use of space. Beauty: Emulating the natural world to create beautiful structures; sculptural elements; visible beams and wood-grain; creative use of recycled materials; natural paints and pigments. Why Take a Natural Building Course? Clearly this is a vast and varied field. Taking a natural building course is a fantastic way to get comfortable with all that it includes. Learning from experienced guides helps to establish a foundation of knowledge. It will help you feel confident when you embark on your own projects. As with all skills and crafts, humans learn a lot from our mistakes. When you teach yourself something, you get to make all the mistakes. When you learn from others, you get to learn from their mistakes and not make them again! Instructors in a natural building course have made plenty of mistakes on their journey toward mastery. You as a student get the benefit of this experience. Industrial or “conventional” building techniques rely on the embodied energy of fossil fuels, machines, and industrial materials. Natural building modalities rely more heavily on labor. People power is what fuels this more sustainable way of creating structures–along with the appropriate use of technology, of course. We love our chainsaws, impact drivers, saw mills, etc. But without human energy, it just doesn’t work. 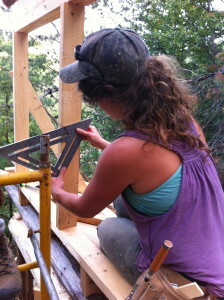 A wonderful thing about taking a natural building course is that you get to meet others who are excited about it too. During the course you learn how to work as a team. Afterward It’s a no-brainer to go from learning together to helping each other build if you’re in the same region. Ask yourself what your goals are as you pursue this new skill set. Do you hope to build your own tinyhouse? Do you dream of a cob oven where you can host pizza parties? Are you wanting to learn how to use the natural resources on your land to build with? Are you wanting to get a feel for lots of different aspects of natural building so that you can incorporate them into your projects? Make sure you choose a natural building course that covers what you want to learn about. If your goal is to build a tiny house, choose a tiny house course that involves natural building principles and practices. If you’re wanting to learn about many different modalities, make sure the course you pick includes an overview of natural building. Another thing to consider is your skill level going into the natural building course. If you don’t have any experience using tools, it might make sense to begin with a basic carpentry course before you pursue natural building. If you are a contractor or carpenter with loads of experience, you may need to pursue a natural building course that is beyond the basics, and that covers building codes and regulations. Whatever your goals and skills going into it, choose a natural building course that is appropriate for your bioregion. Learning how to build with clay is much less useful if you live in a rocky area without any available clay. Building with lots of thermal mass and insulation is irrelevant in the tropics. Choose a course that will teach you how to work with the natural environment in which you live.